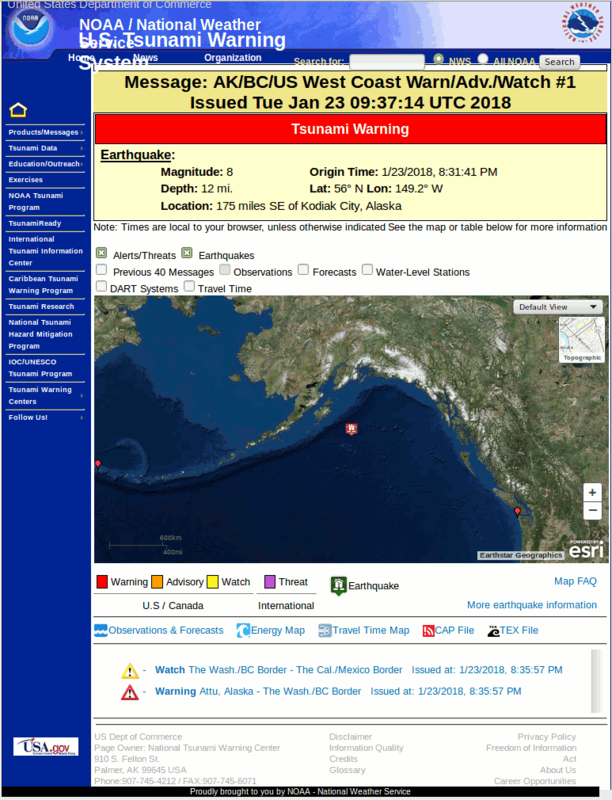 The U.S. Tsunami Warning System issued a warning after an earthquake near Alaska at 01-23-2018 09:35:57 UTC. However, when I checked the home page at 11:15 UTC the map did not show the earthquake location and instead said "Earthquake Layer failed to load" and "Alerts/Threats Layer failed to load". This would appear to be because the system was overloaded. I then canceled the page request, not wishing to make the situation worse. 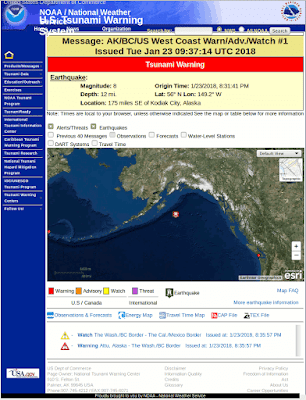 TSUNAMI WARNING 4: See http://tsunami.gov for alert areas. However, these maps are difficult to interpret, as they showed a series of predicted arrival times as colored lines, with no scale as to the size of the wave. The waves were shown reaching Australia in 11 hours, although no warning had been issued by the Joint Australian Tsunami Warning Centre. Colored dots on the map indicated the location of tidal gauges and "DART". Not explained on the map, DART is a system of "Deep-ocean Assessment and Reporting of Tsunamis" detectors. The tidal gauge and DART locations are not of use to someone who wants to know when, when and how large a tsunami to expect. These should be omitted from the map, unless they show a reading. 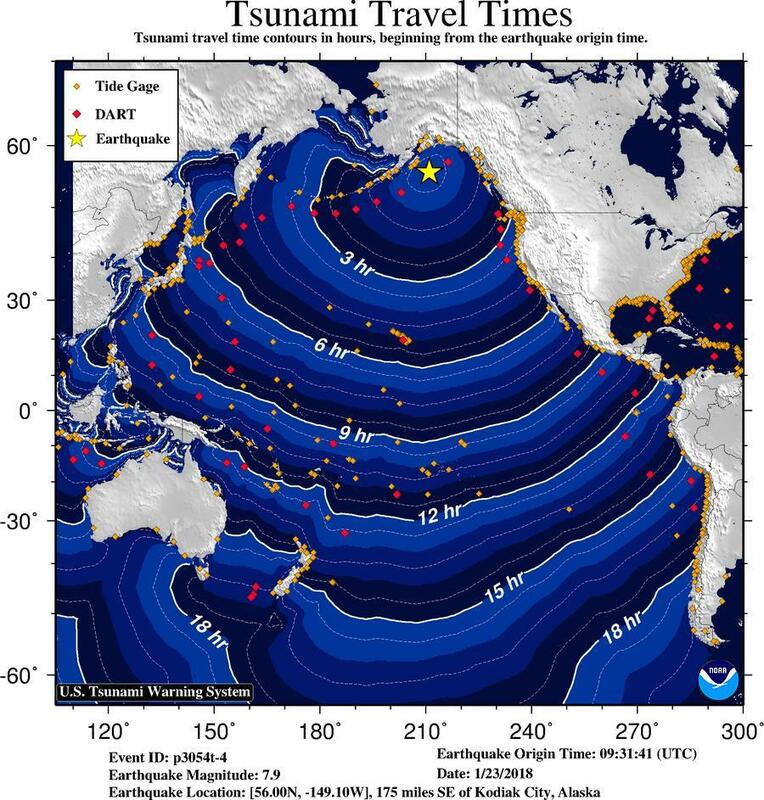 The predicted arrival time should be limited to a few hours, until the existence of a significantly sized tsunami is confirmed.